Russian society is essentially a religious society. Most of them are Orthodox Christian, while the second is a Muslim minority by the number 24.5 million. Not surprisingly, many places are found mosque and church. Even more unique, the church there has a dome like onions, while most mosques have a pointed dome. One of the mosque which must be visited are the St. Petersburg Blue Mosque. This mosque stood firm not far from Peter and Paul Fortress. Precisely alongside Alexander Park or just enough about a two minute walk from the Metro Station Gorkovskaya. The location which is just down the road, it is very easy to recognize. Towards this place, you can just use the metro and get off at the station Gorkovskaya. According to a lot of information, this mosque is very old. Previously established by workers who completed the Peter and Paul Fortress. 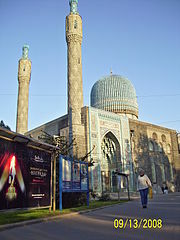 They generally come from the southern Russian region that is since the 9th century, has embraced the religion of Islam. The mosque is named Jamul Muslimiin fully built into a mosque in 1910 from the hands of two christian architects named Alexander von Googen and Vasiler. Both towers soaring as high as 48 meters, while the blue dome very grand with a height of 39 meters. Today, the mosque can accommodate 2,000 worshipers. Outer dome of blue in it there are carvings and paintings like in the Arab countries, in the middle of a big round hanging lamps encrusted calligraphy Russian-made weighing more than two tons. Mihrab of blue mosque decorated by blue marble with a special design. In the middle there is a calligraphy said God’s message of peace on earth. Mihrab made of wood with a ladder high enough. At the time of preaching, preachers there at a certain height and can be viewed by all pilgrims. On the right of the mihrab there are two teak calligraphy. One other relatively large and rather small. Both calligraphy is quite striking because it highlighted a fairly bright light. This calligraphy is a symbol of closeness between people St. Petersburg and Indonesia. Large calligraphy was a gift from former President Megawati, while the medium size of the former Vice President Jusuf Kalla. There is an inherent deep impression on Muslims in St. Petersburg on the merit of Indonesia’s first president, Sukarno. In 1955, Sukarno’s and his daughter Megawati visited with the Soviet Union, and stopped at St. Petersburg. When he returned to Moscow, Soviet leader asked, what impression with the President, on a visit with beloved daughter to St. Petersburg. Cash Sukarno replied, he had not been to St. Petersburg. because it hurt for him to see a mosque that was closed. Apparently what the former president Sukarno became the ruler of the Soviet Union mind. Not long after that, came the Kremlin’s envoy to the Blue Mosque Leningrad who reported that a mosque can be reused. It is conceivable, in Leningrad Muslims are very happy. Therefore, to date very local Muslims remember the great services of former President Sukarno. Entering the mosque is no need to pay the ticket. Ta’mir mosque just provide charity box for the maintenance of the mosque. It is advisable that travelers keep silence and polite because the mosque is a mosque not found attraction, but a place of worship.